Home » Blog » Are you prepared for the future of Search? We are undergoing a time of unparalleled instability in the search industry. But still, there are elements that are still relevant. Over the years, search has been almost completely about Google and what you type in that simple one line search field. However, over the past few years, there has been a definite shift in this connection, as digital assistants like Amazon’s Alexa, and voice-search assistants such as “Okay Google” move to the fore-front. This shift has made search results become considerably more varied. The way the general consumer approaches search has also changed. If you’re a marketing professional, or a small business owner, you need to come-to-grips with the fact that consumers are not always typing in keywords and key-phrases on Google. The modern consumer is speaking full sentences into their voice or digital assistant expecting results. For example, if you own a used car dealership, your typical consumer may not type in “used car dealer”, instead, they may voice search specifics such as, “used 2016 Chevy Camaro SS with manual trans and low miles near me”. This is quite typical, especially for age groups 20-44. We get calls quite frequently from small business owners that are still under the impression that the SEO tactics from 6 to 10 years ago still work, and they don’t. In their defense, a selected few do, but they are not nearly as effective as they were in the past. If you have a small 5-page website with thin content and poor structure, you may find it impossible to rank high in the new world of voice search and digital assistants. We haven’t even touched on modern conversion techniques. Getting found is only half the battle. A bit of advice: Use video, develop your internal pages, write creative articles, get on the proper framework, use social media, write GREAT content, and make sure your website is user friendly. These are just the basics. Call us for a free SEO evaluation. 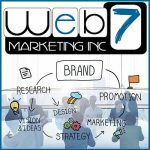 Web 7 Marketing is a top SEO and web design firm in Oakland County Michigan.